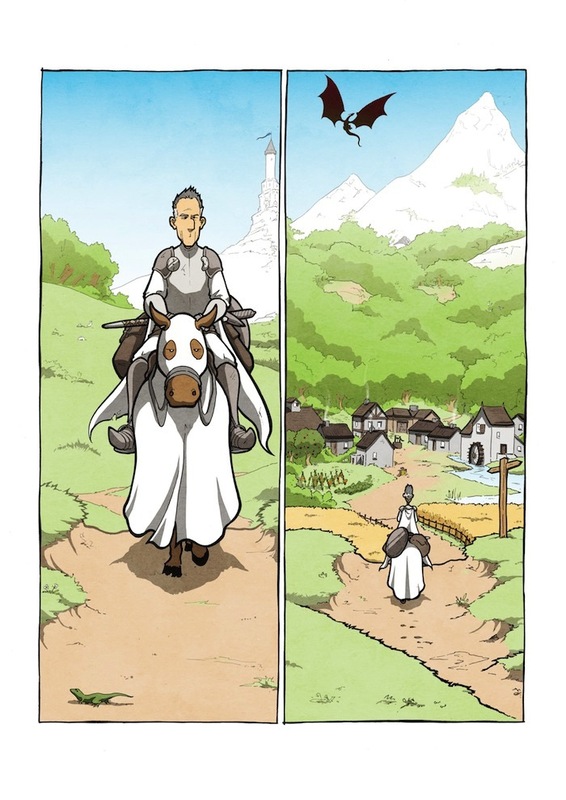 Knight&Dragon is a comic book for all ages, that offers the readers the possibility to decide the outcome, depending on the character who’s story they choose to follow. Light-hearted, yet compelling, it’s one of the newest comic books created under the Improper Book label. 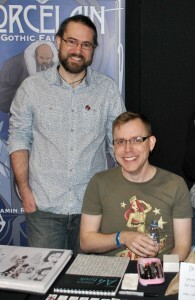 We got to chat with its creators: Matt Gibbs and Bevis Musson who answered a few questions about their creative process, the choices they’ve made regarding this comic book and the future projects that we may expect from them. GP: Could the two of you say a few words about yourselves? Give us a clue as to who the people behind the comic are? Bevis: I’m Bevis Musson. I’m mostly an artist, but I also write as well, and have been floating around in the British Small Press scene for a good few years now. Matt: And I’m Matt Gibbs. I’m a writer and editor, working mainly in comics and games, including working as the managing editor of Improper Books. GP: Knight&Dragon sounded like it will be a brutal tale of blood and, quite possibly some gore. I found myself surprised at how different from my perception of its name the story was. In a good way. Can you tell us how this story came to be? Where did the idea come from, how you two got around to putting pencil to paper and bringing it to life? Matt: I’ve always been a huge fan of Choose Your Own Adventure and Fighting Fantasy books and I wanted to do something along those lines, playing with branching narratives in comics. 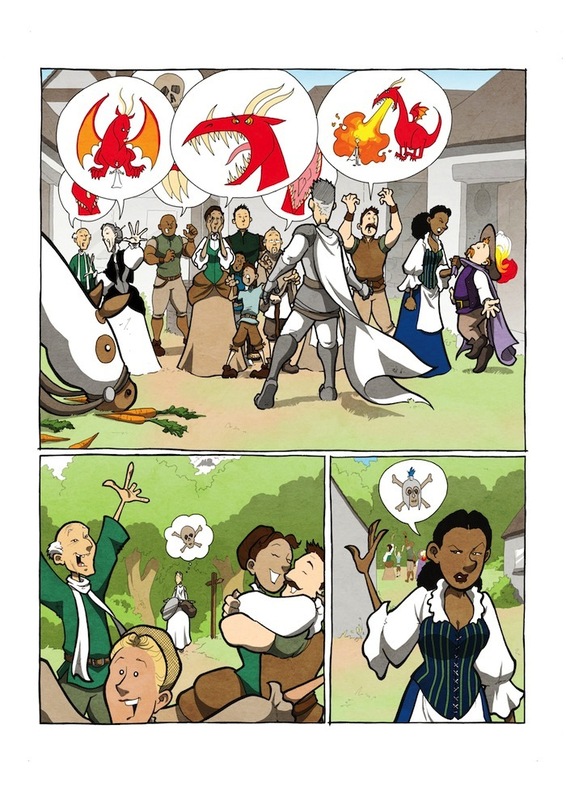 At the same time, I wanted to create something playful and accessible for all ages and the idea of the traditional story of a Knight, Dragon and Maiden seemed a perfect one to subvert. Bevis: I think even from the start we set out to tell a story that approached the traditional tale from a slightly different viewpoint. The nature of the book, with multiple storylines and endings, meant that a straightforward battle wouldn’t really have worked anyway. The more playful cat and mouse story appealed more to both of us and certainly suited my style more as well. Matt came to me with a fairly complete script that I did some character designs and sample pages for that then actually led on to a fairly major rewrite. There was a lot of interplay between the writing and the art like that. Some things changed in the script because I found a better way to make it work visually, some ideas that I had for layout or art simply didn’t work because they didn’t serve the story the way they needed to. It’s always very rewarding to work on a book with that kind of give and take on all sides. GP: Why did you make Knight & Dragon silent? While I was going through the pages, I have to admit that the images were so compelling that for the longest time I imagined the dialogue in my head, without acknowledging it wasn’t there, so it seemed like a perfect choice, but what was behind it? Matt: The main intention was to leave space for the humour and also make it accessible for all ages. By having all the characters speak to each other and think in pictures, it made the whole comic much more playful. It also means that there are no barriers to young children reading and interpreting the book for themselves, as well as no barriers to language. 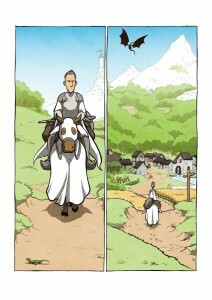 I knew Bevis’ beautiful linework and Nathan Ashworth’s gorgeous colours could pull this off too. There’s something about the styles used on each page that just makes me grin. Bevis: I had a great time doing the ‘dialogue’ in the book, actually. It gave me a chance to use two slightly differing styles on the same page, treat the speech bubbles as extra panels and design the page as one whole with the dialogue as much a part of the art as anything else. I letter a lot of my own work, but there’s something different about getting to make the dialogue in a comic an integrated part of the art in a way that text can never quite be. GP: Everyone is in a constant rush now, yet you chose to make Knight & Dragon a story that can’t be read unless you actually pay attention to the tale and follow the clues. What motivated that? Matt: I’m not sure that was ever a consideration on our part. I guess the lack of words does make the reader look at each individual panel and the page as a whole, rather than rushing through reading just the dialogue or captions. The page turns, the mechanism at the bottom of each page where we direct the reader to the next step of the story, slow it down a little too. That probably also helps focus reader attention. Bevis: I do think that a lot of people reading comics, and illustrated stories of all types, sort of skim over the drawings because they don’t have to ‘read’ them. By not having any text, but still having speech bubbles that you need to read to understand the story does mean that you approach the book in a slightly different way. That can only be a good thing, and also means it’s accessible regardless of your reading age or language skills. It also means that you can read the same dialogue in a slightly different way depending on which path you’re following through the book. GP: Now, the Knight’s tale had a definite ending, or several endings. Do you plan on maybe writing more of the Knight’s story? 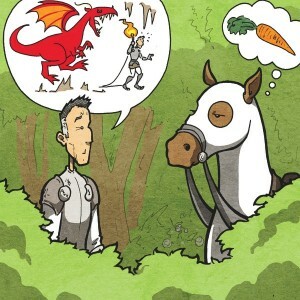 Maybe have a Knight & *insert mythical creature here* in the future? Matt: As a branching narrative it lends itself to so many different stories with multiple protagonists. We’ve got ideas for other books in a similar style, but I don’t think we’d revisit the Knight, Dragon and Maiden just yet. We have ideas for something more fairy tale perhaps, such as Red Riding Hood or Hansel and Gretel. Bevis: I don’t think either of us would rush back to these exact characters straight away, no, but I certainly wouldn’t be adverse to going back to them at some point in the future. There’s certainly a lot more of their world that we could see. We’re more likely to come back to the specific format rather than the characters though. GP: The not-so-helpless maiden was quite a nice surprise. I know a lot of people would’ve preferred a classic tale where she really needs rescuing, yet here she rides off on the dragon or gets the guy she wants, without actually depending on him to save her. You chose to go against the classic tale, which despite the changes in society seems to still be the norm in the media. What made you choose that as opposed to the thing that “sells”, so to speak? Bevis: The whole set up of Knight & Dragon is a little different from what you might expect and even from the very early proposal it was clear that Matt didn’t want to just have the same old fairy story and the same old tropes. By having the Maiden being a lot more forceful, a lot more in charge of her own destiny, it opens up the story in a way that you don’t normally get. Also, almost all the comics that I’ve done in the past have revolved around women and I think that’s part of the reason that Matt asked me to do the book. Even if she hadn’t been that in control in the original proposal I’d have asked to go that direction when I came to draw it. That said, even though she was a dominant character in the script I made a conscious effort to make her even more so in the art. She’s not a passive character in any way, even when she’s tied to a stake. I did several different design proposals for her before we started properly and in one she was your traditional blonde, petite princess type, and to be honest she didn’t work. She didn’t fit the story at all. I’d almost go so far as to say she wouldn’t let me depict her like that. She doesn’t look like the ‘normal’ damsel in distress and she doesn’t behave like that and that’s probably why people like her so much. Matt: As Bevis said, from the outset it was our intention not to make her another damsel in distress that needed saving. Even without the structure of a branching narrative, where you need more potential and surprising directions for each character to take, I don’t think either of us would ever want to create a character constrained by that mould. 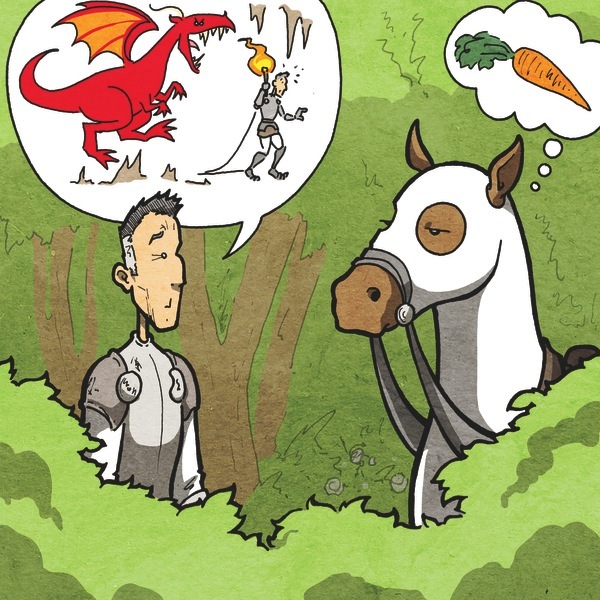 In many respects the book isn’t called ‘Maiden, Dragon & Knight’ only so that we could surprise and delight people as we updated the classic story. GP: I found myself wishing for more of the horse’s path. He was one of my favourite characters. Did any of you have a “favourite”, someone whose path you enjoyed more than the others? Or is it like me making you choose between your children? Bevis: When we first started talking about doing Knight & Dragon, Matt asked me what I like to draw and what I don’t like to draw. The one thing I said I don’t like drawing was horses. Drawing horses makes me want to cry, even once I worked out he could wear a tablecloth so I didn’t have to draw his legs. And despite all that the Horse has become the break out star and steals almost every page he’s on. So naturally the Horse has pretty much come out as the most popular character with everyone else. Almost everyone read the Horse’s story or the Dragon’s story first and a lot of people wanted to know more about them, especially the Horse. I’m not sure if I had my own favourite as such. The Horse gave me the most chances for comedy and the Dragon was probably the most fun to draw, but I think my favourite was probably the Maiden. It was great to draw someone who is so much of a type, but completely goes against all those expectations at the same time. I also liked drawing the Farmhand a lot, but that’s just because any excuse to draw beefcake pleases me. Matt: Everyone loves the Horse! So I’m pleased I was able to talk Bevis into drawing him… Sorry, Bevis. As to my favourite, yeah, it is like deciding between my darlings, but if I had to pick only one it would be our Maiden. A great deal of the book hangs on what she decides to do, especially the final outcomes. It’s a close call though, as the Horse adds a lot of humour to all of the paths and, as Bevis pointed out, often steals the scene. GP: Are there any other projects the two of you are currently working on? And that you can talk about? Or any project that you would like to do in the future, but haven’t had the chance yet? Matt: Bevis and I are planning another fairy tale inspired comic with Improper Books. Something more traditional this time and linear, but very much in the same all-ages style as Knight & Dragon. It’s still early days though. Alongside that, I’m working with Sara Dunkerton on another all-ages title, this one is an anthropomorphic tale about mice, which we will be releasing more details of soon. Bevis: Yeah, the story that we’re working out at the moment is very exciting. As Matt says it’s much more linear, but it’s playing with the traditions and themes of fairy tales and making something new of them. We’re also looking at exploring the nature of design and layout in comics too. We’ll have to see how that pans out though as we go on with the planning of it. I’ve also got a couple of other irons in the fire, not least getting on with finally doing the next issue of The Dead Queen Detectives which has been coming imminently for at least three years now.